Kauai homes for sale are as diverse as they are beautiful and many buyers are eager to purchase properties with full concierge services. From the luxury Princeville condos to the Waipouli Beach Resort, these residences allow owners to enjoy all that Kauai has to offer, while their everyday needs are taken care of. Wanting your dinner reservations booked? Check. Need your dog taken for a walk? Check. In search of a reputable laundry and dry cleaning service? Check and check. Browse the real estate listings below to search for homes with concierge services. Or keep reading to learn about Kauai homes for sale with luxury amenities. Register with us today to save your searches and to be notified when a property that meets your criteria becomes available on the market. Invest in Kauai real estate with concierge services and have a worry-free retreat to call home. Many of the properties available with concierge are gorgeous luxury condos, ideal lock up and go residences. 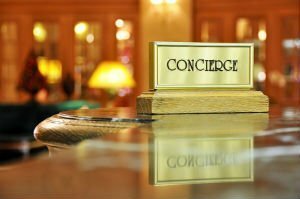 These concierge services will assist you with every need from housekeeping to arranging activities to booking transportation. These services are available to enhance your luxury lifestyle, allowing you to focus on other tasks such as spending time with family and friends. Why bother searching for the phone number of your favorite restaurant on Kauai to make a reservation when the concierge can do it all for you. And don't waste a beautiful Kauai day staying inside cleaning! Concierge will hire a trustworthy housekeeper for you. Or if you need someone to housesit while you're away, you can rest easy knowing they've got you covered. Contact Anne Eliason to learn more about Kauai properties with concierge services. Or simply call her at 808-855-5808.